Sunday, April the 14th 2019 – At the opening of the 113th edition of the Rolex Monte-Carlo Masters, eleven of the best players participating in the Tournament had the immense privilege of being received by H.S.H. Prince Albert II at the Palace. Accompanied by Baroness Elizabeth-Ann de Massy, President of the Tournament Organizing Committee, and Mélanie de Massy, the players were welcomed at 4:30 pm. After visiting the magnificent Throne Room in the State apartments and discovering the Palace Tank, they were able to meet His Serene Highness in the sumptuous Mirror Gallery for a cocktail. 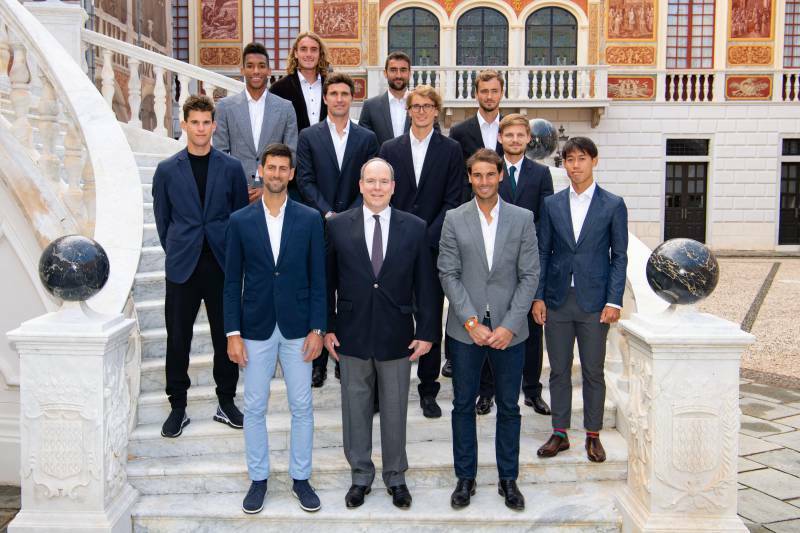 Novak Djokovic, ATP number 1 and resident of Monaco, presented H.S.H. Prince Albert II with two balls signed by all the players present for H.S.H. Crown Prince Jacques and H.S.H. Princess Gabriella. Mischa Zverev played the role of an improvised journalist for an interview granted exclusively by H.S.H. Albert II Sovereign Prince of Monaco. The champions present: Novak Djokovic (ATP N°1), Rafael Nadal (ATP N°2), eleven times winner of the tournament, but also Germany’s Alexander Zverev (ATP N°3), Austrian Dominic Thiem (ATP N°5), Japan’s Kei Nishikori (ATP N°6), and Monaco residents Marin Cilic, David Goffin, Daniil Medvedev, Mischa Zverev, and finally the young Stefanos Tsitispas and Felix Auger-Aliassime, 18 years old, a recent semi-finalist at the Masters 1000 tournament in Miami.